Things are starting to move along again. I now have dates for the next IVF cycle, which is exciting and completely terrifying. All the appointments and down time will be more difficult to juggle this time around. My hubby is back to work and can't help out much. Also, I have to drive my kids to their school in another district (3x a day since my son is full-day and daughter is half-day) which adds up to 1 1/2 hours of driving time each day. We have no family in the area to help out. Add in all the trips to the clinic (in the opposite direction of the school, of course) and it gets a bit messy. I was very pleased to learn that my 24-year-old single brother can come stay with us and would arrive just when this cycle gets seriously underway. He would be a great help. There's just one problem. My mother is threatening to come out here with him for a visit. It looks like she would be here during the stimulation phase of the cycle. I am less than pleased about this and here is why. I want to "just relax" as much as possible this cycle, but how can I with my mother in my house? I've suggested she come in the spring instead, but with my brother driving out it's a free ticket for her come now. And I really want my brother here. Grrrrrr. I have endeavored to keep my parents in the dark regarded our attempts at family building. For me, not telling is great, but I'd rather avoid outright lying. Is it because I have impressively high morals? Well, I can't lie to you - NO. It's because a brain that functions this poorly can't possibly remember all the fabrications and sanitized versions of the truth required to be a convincing liar. While it's possible to keep the IVF secret even with her here, I'd still have to deal with a barrage of criticism about my parenting, poor participation at church, and LOTS more I'm sure. It's not a situation conducive to relaxation and I hate the idea of having to put up with it! 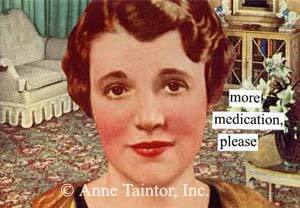 Being on powerful hormone drugs during my mother's visit may be a recipe for disaster. It would be better to be on antidepressants or perhaps in a drug-induced coma. Do you want me to drive up there and toilet paper her house the night before your brother leaves? Maybe Oreo her car? I guess I could send her a fake jury duty notice for the EXACT time she wants to visit? No? Perhaps a forged letter from the 1st presidency urging her to stay home and do service that week. Well it sounds like you need to come up with a plan to keep your mom where she is. Can you tell her to please not come? That you were looking forward to some sister/brother time? Do you have another sibling that could ask her to come visit him or her? Maybe your brother can lie and tell her that he isn't coming after all. I like Meim's jury notice idea. Best of luck tackling this latest hurdle. That is awesome (and terrifying as you said) you have some dates for your next IVF cycle. I just came across your blog for the first time. I was reading through a few of your posts and I'm so sorry for your losses. I'm also sorry you are feeling pressured into having your mother come along with your brother for a visit. Having people invite themselves to stay is hard enough but given the fact that your mother thinks that if someone is ill or has a chronic condition, it's their own fault... I can certainly understand why you don't wish for her to visit at this time. It sounds like any benefit from having your brother come visit now would be canceled out if your mom joins him. My stepmother-in-law insisted on flying in from out of state to "help" after one of my laparoscopies. I was very anxious about this plan but my husband and I did not find an effective means of saying no. What resulted was one of the most stress-filled weeks of my life. Seriously, any help she gave was more than canceled out by the tsunami of anxiety associated with... how things ran when she was in town for a week. It was very, very stressful. I like the ideas from jrs above. If your mother is at all like my stepmother-in-law, including the word "please" will not work. This nicety would be viewed as a sign of weakness by my stepmother in-law. If we asked her to "please" not come, it would be equivalent to sending a silver-engraved invitation. The only way we could say (and enforce) "no" with her is for my husband and me both to consistently and firmly tell her no. Offering specific explanations as to why we are saying "no" just gives her ammunition to poke holes in our reasons. The vaguer, the better. Based on what you've described... Unless you decide to go the brother lying to your mother route, the most effective way to keep her from coming is to say no. This may not be easy or fun... but neither will it be if she invites herself to your house for X amount of time. Sorry to leave such a long comment but I have been through the "how do I un-invite someone I never invited?" situation more times than I care to remember. So, I just thought maybe I could help. Congratulations on getting a date scheduled.